Navy SEAL Marcus Luttrell, author of the #1 bestseller Lone Survivor, tells his own extraordinary war stories—and those of others who have chosen to serve. 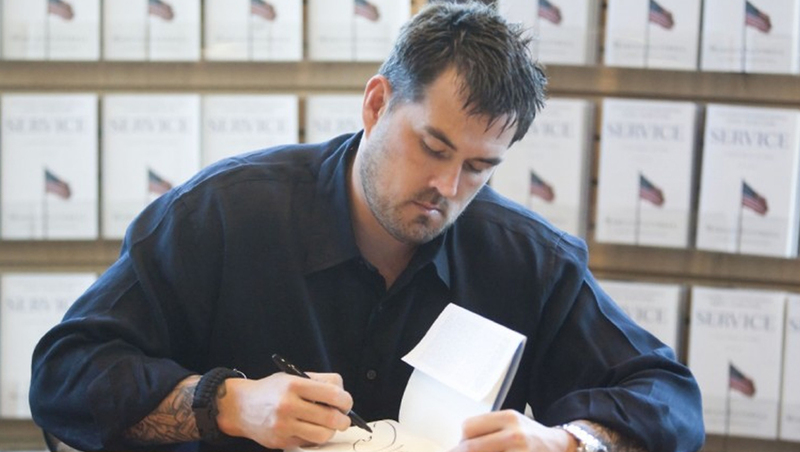 In October 2006, after miraculously returning from his star-crossed mission in Afghanistan, Marcus Luttrell went back to war. in six months of high- intensity urban fighting in the most dangerous city in the world, Ramadi, iraq, he was part of one of the greatest victories in the history of the SEAL teams. a rare few choose to risk their lives to serve their country. Drawing on the experiences of warriors of all generations and service branches, exploring their amazing stories, Luttrell has produced a profoundly moving testament to American courage and sacrifice. SERVICE is both a war story for the ages and a heartfelt tribute to all who have served. I am SOOO enjoying Lone Survivor and am so looking forward to reading Service. I cannot tell you how proud I am of you and your brotherhood. As one of you said recently, “You don’t need to know what we’re doing. You just need to know we’re there.” My cousin gave his life in Gulf War I. He was a Harrier pilot. Last day of the war. Ejected. Rounded up and killed near his plane. Heavy weather had set in and rescue couldn’t reach him. In that respect, I “get” a small part of what you guys do. Again, thank you for protecting us. You’re the best! I just finished reading Service and it was amazing. I picked it up and didn’t set it down until I was done. Lone Survivor gripped me the same way. I served 6 years in the Army reserve and 2 years in the Navy reserve as a Corpsman. I didn’t get to see active duty nor the things that Marcus saw. Words cannot express my gratitude and admiration for Mr.Luttrell and his teammates. I have subsequently tried to get my hands on and read anything that pertains to the SEALs, Warrior Elite, Fearless and Heart of a Lion, all outstanding books about outstanding individuals and teams. Thank you for your service and reminding us that great American heroes still exist. I read and have passed on Lone Survivor to everyone I know. I have a new hero to add to my list now, Marcus Lattrell! He joins a distinguished list including, my biggist hero, John Luckie (who just happens to be my husband), my father, Bob Mittry, he raised my to respect our military to the enth degree and I’m so thankful for that, he also gave me my conservitive values. Another member of my hero list is President George W. Bush. I beliveve history will show what a great president he was. He did what he said and said what he did – I believe he is a very dedicated American and Christian. So, Marcus, please know you are in good company! Here is a true story you will probable enjoy: My dad was in OCS and there was a 3 way tie for valdictorian, he being on of the candidates. Each candidate was asked the same oral question, ” If you were Commander in Chief would you have dropped the bomb on Hiroshima?” The other 2 candidates replied “no it was mass distruction and killed masses of people.” My dad replied ” Absolutely. Wars are fought to be won, it ended the war and savedhundreds of lives.” He was voted valdictorian! Just saw you speak this morning at our conference. I could not wait for you to finish. The anxiety was horrible feeling what you must have felt but I am sure it was nothing like what you felt. You are an inspiration. My survivor plate for breast cancer is nothing compared to what you survived. Witnessing your friends die. You are a true inspiration to us all and your statement that we can think of you when we are having a bad day and feel blessed. God bless you and your family. Thank you for what you did for your country! May you have a long and blessed life. Dear Mr. Luttrell I am deeply moved by what you have done for this Country. I first heard of the book Lone Survivor from my step brother and right after he finished telling me about it I went and bought it. The detail put into it made me feel like I was right there with you guys. Growing up my dream was to become a Marine or a Navy SEAL sadly that dream was destroyed. I found out I had Type 1 Diabetes before entering 7 grade. I’m now a Senior at Kuna High School and havent let it slow me down. Reading Lone Survivor gave me strength to keep pushing forward. I have told all my friends about your book and now they to own it and read it. I can’t wait to get Service and read it. God Bless You and Your Family. I write this today on a very emotional day for me. It is the day of remembrance for holocaust survivors, and I was recalling stories my father told me about his family. I’m lucky because my dad is still alive and is my hero. He talks about the camaraderie he had with his 5 childhood friends that all perished at Auschwitz, and that always led me to want to be a SEAL, the team with the greatest camaraderie in the world. In 1985 I was training at the beach for what would be a huge crossroads in my life. Try and become a Professional Soccer Coach or pursue my real dream of making a SEAL Team. Both dreams were squashed as I broke my neck in 2 places at the Wedge in Newport Beach, Ca. I was not paralyzed, and was lucky to recover some 9 months later to resume normal sports activity, but was denied entry into the military. I am reading your story of Operation Redwing. Your moving account of how your mates were killed around you are heart breaking and I shed a few tears with you when I read it last night. I am much older than you and in a different country/continent, but share the same patriotism and faith. I also have had my share of action and understand what you went through. It was also a soldier who was the first one to acknowledge that Jesus was truly the son of God when he died on the cross. Thank you for sharing your story with us and be so open about your faith. I salute you and let us never forget. I have almost completed reading your first book, LONE SURVIVOR. If SERVICE is anything like LONE SURVIVOR, I have no doubt it will be a phenominal success!! In high school, I would have considered myself a follower, w/a warriors heart & spirit laying dormant inside. By my senior year in high school, I had broken out of that follower mold & began seriously contemplating entering the service. And I wanted to serve in the ARMY RANGERS/GREEN BERETS or the SEALS. I began “training”, began talking to recruiters, reading up & researching & realized that I felt I had found a brotherhood to which I belonged. Unfortunately, I was raised by a very loving & devoted father who could put pressure on his son when he disapproved. To make this shorter, I would have/should have served in the first Gulf War & there is not a day that goes by that I don’t wish I had served. Would I have died or would I have survived? Only the good Lord knows. My heart aches daily knowing what I was supposed to do, called to do, felt in my soul I was born to do…. & didn’t. I pray daily for you & your brothers – both fallen & living. I would gladly take up a rifle & stand with you any day of the week & twice on Sunday. I know I shouldn’t live in the past, but knowing that I wasn’t there serving when I feel so strongly that I should have… It’s a curse I will live with for the rest of my days. I have taught my daughters and have begun teaching my grandson to RESPECT the armed services. If I see a serviceman/servicewoman in dress uniform or fatigues, it makes no difference, I walk over & tell them from the bottom of my heart & soul how much I appreciate their service & their sacrifice. With out them, this great nation wouldn’t exist. Marcus, I hope to one day meet you face to face, to shake your hand & ask your forgiveness for not being where I should have been & to thank you for your service & sacrifice. Marcus, having served 23 years in the military myself, I feel that I have to tell you that I am awestruck by your service and what you and your brothers do, went through and I want to sincerely thank you for your service. I read Lone Survivor several months ago and just saw the movie last evening. What you and your brothers endured and that you actually came out of that alive is a testament to the Seals and this country is for ever grateful for warriors like you and your brothers. Thanks again and thank you for the opportunity to leave a remark on your site. Drive on. Valla…ayer mismo vi la pelicula..he de decir que el libro no lo e leido porque no estaba familiarizada con esta operación, siempre me ha parecido que los SEALS eran algo increible, personas capacitadas para lo indecible, preparados para solucionar cualquier problema y situación, pero a veces las cosas no salen como deberian, me impresiono muchisimo la película, me dio muchisima pena descubrir las verdaderas caras de los verdaderos SEALS y ver que nunca regresarían de aquella operación, creo que ese día la suerte no estaba de vuestro lado…y también creo que los soltasteis aun sabiendo que probablemente esa sería vuestra perdición..Solo decir que sois heroes. I am a retired Chief Hospital Corpsman and I served with the 3rd Marines in Vietnam. I have the upmost respect for our SEALS and MARINES. It would be an honor to meet you Doc.